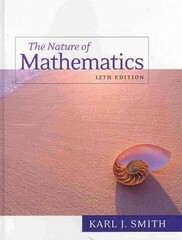 Nature of Mathematics 12 Edition Experience mathematics--and develop problem-solving skills that will benefit you throughout your life--with THE NATURE OF MATHEMATICS. Karl Smith introduces you to proven problem-solving techniques and shows you how to use these techniques to solve unfamiliar problems that you encounter in your day-to-day world. You'll find coverage of interesting historical topics, and practical applications to real-world settings and situations, such as finance (amortization, installment buying, annuities) and voting. With Smith's guidance, you'll both understand mathematical concepts and master the techniques.